(my-ym) – architect, phonographer and sound artist based in Riga, Latvia. Since 1998 participates in architectural / interdisciplinary art events / workshops throughout Europe. Has published sound works in compilations on such labels as SIRR (PT), Gruenrekorder (DE), Universinternational (FR). Active in field recording since 2002. Focusing on sound gathering as non intervention policy for observation of structural models in nature. Usually field studies such as field-mix, soundscape mapping, sound-gathering become basic material for following work in studio. In his field research mainly interested in biotopes referring habitats of insects and small creatures, self-referent and macro scale structures. Recently involves self-made acoustic and electro acoustic instruments and sound objects as tools for mutual discourse with nature. In 2007 initiated sound impromptu collective "bernu rits" – "children morning". 2002 – Graduated Faculty of Architecture. RTU, Riga. 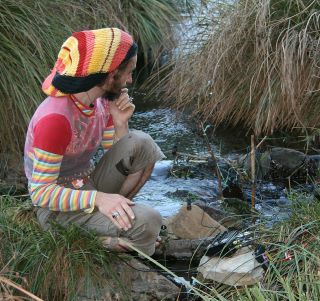 2007 – Initiator of sound impromptu collective "bernu rits"
– "soundforest 03" – participance in festival of experimental music, LV. – cofounder of net label "audiot"
– "soundforest 04" – participance in festival of experimental music, LV. -"mikrostraava" – co-organizer of series of events dedicated to microsound and experimental music in Riga. -"PostsovKhoZ-4 / isolation" – International Summer Arts Symposium. MoKS,Mooste, Estonia. -"TAJU-O5" – multimedia event / workshop, Hyvinkaa, Finland. – "PTM #2" – art symposium. Nodar, Portugal. – "soundforest 07" – participance in festival of experimental music, LV. – "mijatmina" – organizer of soundscape festival. Riga. – "Riga Sound Locations" – co-organizer of sitespecific sound workshop in collaboration with John Grzinich and gallery NOASS, Riga, Latvia. – "Fronte[i]ras 07" – I international meeting of transdisciplinary art. Portugal/Spain. – "SKAN" – sound installation exhibition. Riga, Latvia.